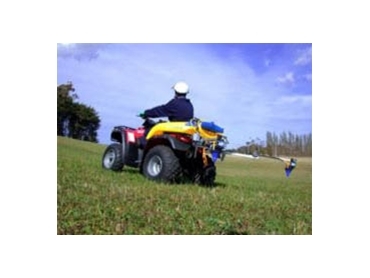 Pumps and Sprays offers C-Dax CDA low volume spray booms that have been designed for use with ATV vehicles. CDA double atomiser spray booms have a spraying width of 3.6metres via a 10mm, 580psi delivery hose that measures 6metres in length. CDA low volume spray booms create reduced amounts of spray drift and run off, and also feature a simple three-step calibration method and boom breakaway protection system. The Quick-Smart attachment system facilitates fast and simple fitting of attachments. CDA low volume spray booms for ATV vehicles are supplied with pressure regulator, wiring loom, on and off control box and dry break couplers and plumbing kit. An additional option is a triple atomiser spray boom that has a spraying width of 5.4metres.